In her roadmap announcement, Gali Kling Schneider mentioned that a mega menu — a more detailed, more descriptive navigation — is on its way. Next week, it will be here, and you’ll be able to witness its glorious mega-ness for yourself — when this new navigation rolls out across the site. 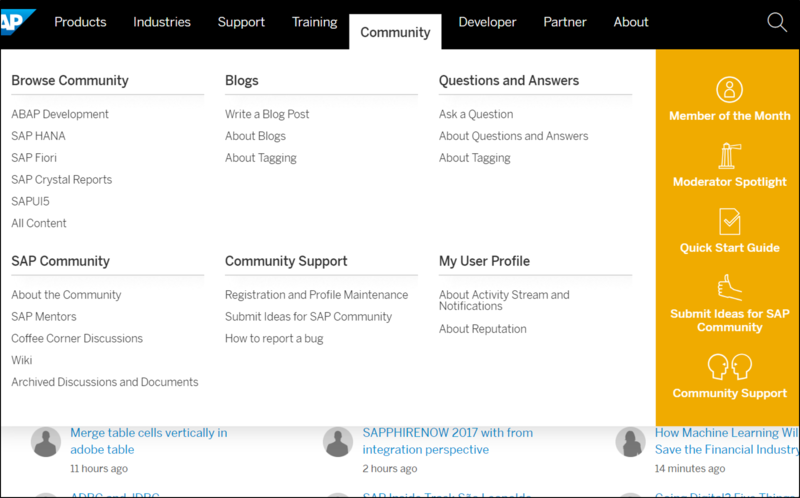 As Gali mentioned in her roadmap post, the mega menu is meant to provide “easier navigation, along with methods for finding content within the community.” As the drop-down menu above shows, you’ll be able to go directly to several sections within the SAP Community, all grouped by plainly named categories. With the new navigation, you’ll be able to get to the bulk of the community with a single click, whereas with the navigation above, you can only go to a top-level page — and you need to find your way from there. This new navigation is far different from what you currently experience, so we didn’t want the change to surprise you next week. You may notice one other change next week — on the SAP Community home page. For the next 3 months, SAP will feature seven of its partners on this page. These partners offer innovative ways to supplement or extend SAP solutions, services, and products. These partners have been selected based on a previous arrangement with SAP, where each had offers that were removed when the new SAP Community experience went live in October of 2016. 1/ We are getting colors! Orange, to be more precise. As an overall visual appeal, the new menu is an improvement over the old gray gradients, pictures within the menu and inconsistent design of the current one. Unfortunately, the orange background with white text fails WCAG 2.0 AA with 1.99:1 compared to the 4.5:1 for regular weight, normal text. The menu shadow does not match the design of any other menu in the site. Hopefully, the rest will get a facelift, too, because no two menus are alike anymore. The effect of lowering text on hover (I mean the Community text in the active tab), in my opinion, is really unnecessary and does not look cool at all. I assume, that on smaller screens the menu will be very different, probably better optimized, but I cannot tell. Also, the exaggerated shadow on menu borders is a strange design choice, I cannot decide whether I like it or not, but it does not fit well into the flat design concept on sap.com. 2/ The choice of menu items is surprising- a significant part of the links lead to ‘about’… pages, which one rarely visits after a week of using the site. On the other hand, there are just 5 topic pages featured, which makes the mega-menu not as useful as I hoped it to be. 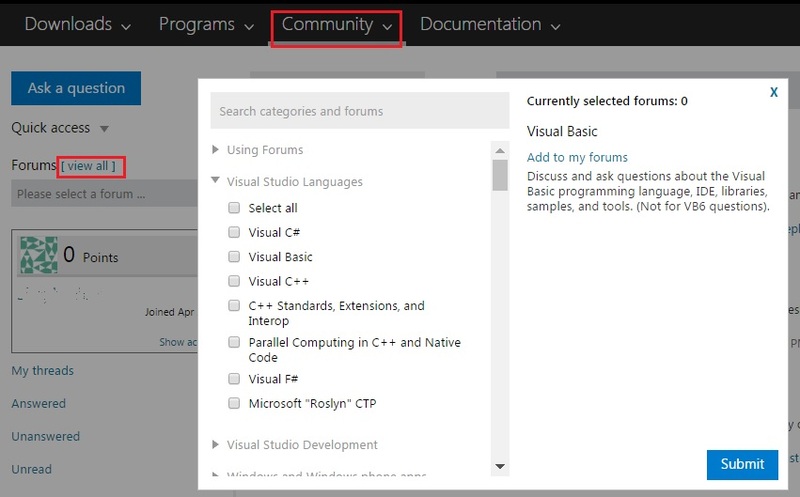 3/ There are duplicated items (Submit Ideas for SAP Community, About Tagging, Community Support). Why do we need them? There is so much content within the site, which could be made accessible instead, I really hope, that this is an early preview version and not what we are actually getting. Overall impression: the designer really tried to do the job, but he/she needed better guidance from whoever assigned the task. Sorry, I wish I could rate the effort higher, but the mega menu does not seem very useful for the majority of the community users – most will click on All Content, or Wiki, or Ask a Question, or SAP Community (I suppose, that this leads to the Community Overview page). Gold vs. Orange color debate aside, I want to address the other questions/comments you’ve posed. The new menu is being updated across the site. We are being updated as part of a wider 1DX menu facelift. We were only asked about what to include in the menu entries. The menu entries are all manually entered so they will not be changing as volume changes on each tag. (In reality, that top 5 list doesn’t change that drastically from month to month anyway.). That said, the gold sidebar is intended for highlighting areas of the site and can/will be updated as the needs of the Community dictate. This is why you see some duplication right now-the white box will be a more permanent listing whereas we can do more frequent updating with the highlighted areas. I actually meant, that if we did not have Community support in the white part of the menu (we have the essential parts in the gold/orange section), or if we combine blogs and questions items into a single column, there would be space to list a few more active sub-communities (there is no single community right now, I am afraid), like MM, FI or Business One, which are also very popular. That’s good feedback and something I will take to the team to look at after SAPPHIRE. Love the ideas – keep ’em coming. Overall I like it, but I have a few questions, too. Will the new menu finally be visible all the time at the top of the pages? At the moment it’s really annoying that you have to scroll back to the top to use it. I’m with Veselina on the doubles: Put “About Tagging” under “SAP Community” or “Browse community” or something and provide links to “All blogs” and “All questions” instead. Not too crazy about the choices under “Browse community”. Are those manually edited or show the topics with the most traffic? But I don’t have a better idea what to put there, either, so that’s not really important to me. Where did the “Overview” go? Or does clicking on the “Community” tab get us there? I don’t mind the orange. ^^ I’m all for more colors, but I wonder how this fits in the oh so strict design pattern, that seems to be the reason for so many strange layout decisions. I’ll try to get your other points/questions later…but one quick response. The color is actually SAP gold, and it’s been around for years now. It was used for our logo for a time, before we switched back to a variation of the old blue logo. Fun fact: When I first started with SAP as a contractor in 2002, I shared a room with Tom Pfister, the author of this article. Small world. Anyway, back to the gold vs. blue. It’s unfortunate that the gold can read as orange digitally (it’s easier to control in print), but elements of it already appear in the community (such as with the Get Started button and the number notifications on your profile image). On the home page, you’ll see a combination of the blue and gold (orange) — blue buttons and links, gold (orange) dividers and illustrations. So…to your last point, Steffi…cool blue colors are still around, but SAP orange (er…I mean gold) is our primary color. As Veselina noted, you’ll find it on other pages already. More later after I dig out from under some emails and finish my coffee. I’d also like to get someone from the UX side to weigh in, as I wouldn’t want to present myself a design expert. I write words and leave the pretty pictures and layouts to more talented individuals. I remember the orange logo… and how quickly it was changed back to blue. ^^ There was a discussion about it in the CC of old SCN. 1) I’m not sure if it will be sticky. I’ll have to check on that one. 2) Do you find the All Blogs or All Q&A views useful? 3) I addressed this in a reply to Veselina above. 4) Clicking the tab or clicking SAP Community will get you to the homepage. We can revisit the white box entries after SAPPHIRE. 5) Color: I won’t do this topic any greater justice than Jerry already has. 2. “All Blogs”… is there someone that uses that at all? Not me. Not enough content for me and to much clickediclick. I’ll wait till that it overhauled and give it another try then. But I use the “All Q&A” page all the time and filter it for my tags (one after the other, because no combining yet). So yes, I find it really usefull. It’s kind of my normal go-to-place. 4. I didn’t know the headlines where links, too… is there any indication? Color change when hovering over it? Or a tooltip? On mouseover, the headline becomes underlined. It’s live today, so check it out and let me know what changes we can make to make it better. I’ll float the ‘sticky’ idea to the team who owns the design of the header overall for SAP.com. First, I click on the Community menu (yes, I need to click on it instead of it jumping at me with flashy colors). That menu (not shown) only has a few items like “Blogs”, “Forums”, etc. The example shown is of “Forums”. Then there is the area on the left-hand side where I can navigate to the particular forums. “View all” opens the pop-up you see in the center. It has many categories that are clear even to a casual visitor like myself (the detailed description that opens on the right is quite helpful too). These menus don’t just fly out, I need to click on them, which is perfectly fine. So it takes me all but 10 seconds to find a Visual Basic forum, for example. On SCN, I don’t know if “All Blogs” and “All Q&A” are meaningful to everyone. Is anyone ever browsing “All Internet”? And I agree that the items never used past the first two weeks are unnecessarily prominent and grouped in an odd way. 5 featured items – is SAP Crystal Reports really the thing? Even bigger than Analytics, IoT, Cloud and Mobility? At this point I’m beginning to think that 1DX was actually a horrible idea. SCN will always be the thing in its own in the SAP ecosystem (and it’s exactly what’s good about it). And since the blogs and Q&A have been split into two different platforms then maybe it doesn’t even make sense trying to combine them into Jive 2. It’s a rather Sisyphean task. Maybe instead of trying to stuff everything into some imaginary constraints we should just embrace the differences and make the best use of every part’s best features? When is the Tag Browser going to be added to the MegaMenu?